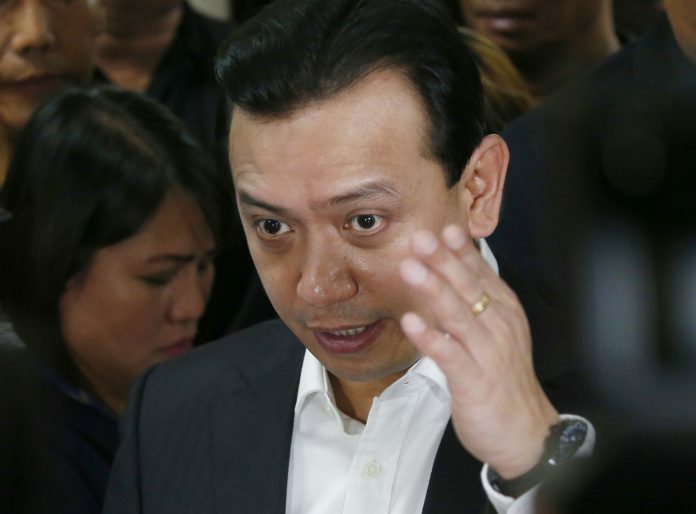 MANILA – A court dismissed the Department of Justice’s motion to issue a warrant of arrest and a hold departure order against Sen. Antonio Trillanes IV in connection with his coup d’état charge for the 2003 Oakwood Mutiny. But at the same time Makati City Regional Trial Court Branch 148 Judge Andres Soriano upheld the constitutionality of President Rodrigo Duterte’s Proclamation 572 that voided the amnesty granted to Trillanes. In his verdict Soriano said the motion was junked because the case against Trillanes was closed in 2011 and the doctrine of finality and executory of judgment should not be disturbed. “The law is vibrant. Jurisprudence is its lifeblood … but for now the court finds itself powerless to disturb the said doctrine even it had sustained the factual bases for the Proclamation 572,” he added. In deciding on the motion Soriano considered Trillanes’ certificate of amnesty, the affidavits of four defense witnesses, and a printed photo of the senator’s application for amnesty. Rey Robles, Trillanes’ legal counsel, told the press the senator was delighted. “Masaya si Senator Trillanes dahil sa bandang huli lumabas ang katotohanan na, unang-una, hindi totoo iyong sinasabi sa kanya na hindi siya nag-file ng amnesty application,” Robles said. In enforcing the Proclamation, the Justice department argued that did not file an application and admit guilt. Still, Soriano upheld Duterte’s power to issue Proclamation 572. “Proclamation 572 is purely an executive act and prerogative in the exercise of the President’s power of control and supervision over all offices and agencies of the executive department,” he said. Malacañang respects the court’s decision. “[The] Palace respects the constitutional independence of the judiciary and it will continue to do so,” Presidential Spokesman Salvador Panelo said in a statement.